Wednesday November 14, 2018 saw Countyâ€™s Out in the Field Data Insurance and Cyber Crime expert Oliver Burns speak at the Orion Farming Groupâ€™s â€˜Making tax digitalâ€™ event. 50 farmers were in attendance as guest speakers from FarmPlan and Nockels Gee also spoke about the need to report tax digitally from 2019. Countyâ€™s presentation was on digital liability and cyber crime; emergent issues for farmers. 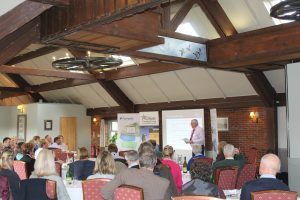 Attendees were treated to bacon rolls and hot drinks at the start followed by morning pastries after the presentations. Over half of all crime in the UK in 2016 was from cyber sources, including hacking, social engineering and system compromise. As County discussed, even farmers who have basic IT systems are still vulnerable from a number of sources to data breaches and hacks. Tim Sydenham, Director at County and a keen data protection advocate, said: â€œAs a business we handle a high amount of data and are aware of the need to protect this asset. For our farming clients weâ€™re recommending they take a few minutes to assess their data hotspots and start to see data not just as dots and digits on screensâ€.